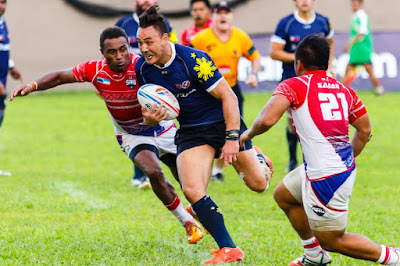 The Philippine Residents Rugby team, a team mixed with the Philippine Volcanoes and the best local rugby players residing in the Philippines, came out with a big win over their rivals the Sabah Eagles on Sunday at Southern Plains, Calamba, Laguna. The Residents were immedately put under pressure by Sabah after an early try to the visitors in the first 5 minutes of the match. It didn’t take long for the Residents to bounce back after Timothy Bweheni broke the line and set up Sosiveta Rura Boila to dive over to even the scoreline. Not long after, veteran Philippine Volcano Justin Villazor Coveney showed his skill setting up Masayuki Sekiguchi to fall on a perfectly placed kick to put the Residents into the lead 10 points to 7. The game was a physical encounter, both teams showcasing a perfect mix of speed, skill and solid defence. Resident and Philippine Volcano Jovan Reyes Masalunga left the field with an injury after a strong collision with the Sabah defence. After the short stoppage the Philippines didn’t hold back with Bweheni once again finding himself in space giving the Residents another 5 points. Jackson Patu converted with the scores set at 17-7 after the first half. “Our performance in the first half was suprisingly very good, you could see our game plan and shape falling into place. Our outside backs were suberb, thanks to quality of clean ball from our forward pack” shared Jake Letts, Team Captain for the Residents team. The second half Sabah started off strong as Joseph Gordon scored under the posts. The score would remain close however ill discipline would cost Sabah another 3 points as Patu capitalized on a penalty goal. This took the score to 20 points to 14 however it wasn't until Coveney provided some much needed breathing space in the 72nd minute for the Residents as he bursted through the Sabah defence to take the Residents to a 25 points to 14 lead. Sabah would go on to score another try under Badrul Musae Muktee, making it a 6 point ball game with 5 minutes remaining in the match. The final play of the game saw Sabah have the chance to win however the Residents held their defensive line until the final whistle was blown. The fulltime bell giving the Philippines a 25 points to 19 victory. The Residents program provides a pathway into selection for the 2017 Philippine Volcanoes Men's 15s National Team. The Men’s National 15s Team will compete in the Asia Rugby Championships in April next year against Sri Lanka, Malaysia and the United Arab Emirates for the Division 1 title.